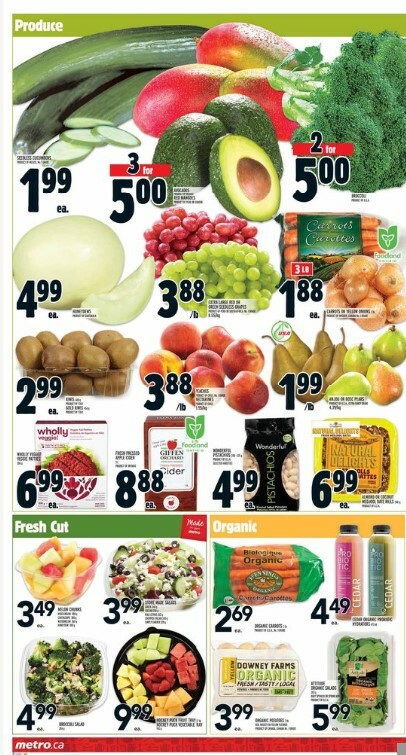 Metro Flyer Canada -January 4 - 10, 2018 -Extra Lean Ground Beef Value Pack Or Irresistibles Life Smart Minced Turkey Or Ground Chicken Extra Lean $3.44 lb Sale Price Extra lean ground beef value pack $7.58 kg. Irresistibles life smart minced turkey or ground chicken extra lean 450 g. Provolone Cheese Or Mastro Hot Or Mild Genoa Salami $1.99 100 g Sale Price $1.00 Savings Deli cut, sliced or shaved. $9.03 lb. Schneiders Meat Pie $2.99 Sale Price Frozen 400 g. Selected varieties. Janes Pub Style Breaded Chicken Or Janes Breaded Fish $5.99 Sale Price Janes pub style breaded chicken 800 g. Janes breaded fish 450 g. Frozen, selected varieties. Schneiders Meat Pie $2.99 Sale Price Frozen 400 g. Selected varieties. Irresistibles Smoked Salmon Or Seafood Appetizers $7.99 Sale Price Irresistibles smoked salmon frozen 130 g.
Seafood appetizers frozen, 284-340 g. Selected varieties. Fresh Tilapia Fillets Family Pack, Aqua Start Cooked Shrimp Or Raw Shrimp $5.99 lb Sale Price $3.00 Savings Fresh tilapia fillets family pack min, 900 g.
Aqua start cooked shrimp 60 70 size. Raw shrimp 51 60 size. Frozen, 340 g. Fresh 2 Go 16" X-Large Pizza Pepperoni Or Cheese, One Topping $8.99 Sale Price $3.00 . Savings Walk-in orders only. Dempster's White Or 100% Whole Wheat Bread, Hot Dog Or Hamburger Buns, Country Harvest Bread $2.99 Regular Price 2 $5.00 . Sale Price Selected sizes. Selected varieties. Kraft Cheese Slices, Cheez Whiz Or Philadelphia Cream Cheese $2.99 Sale Price $3.50. Savings Kraft cheese slices, cheez whiz 450 g. Philadelphia cream cheese 340 g. Selected varieties. Classico Pasta Sauce $1.99 Sale Price $2.00 . Savings 218-650 ml. Selected varieties. Tide Laundry Detergent, Fleecy Fabric Softener, Cascade Dish Detergent Or Febreze Fabric Refresher $5.99 Sale Price Selected sizes. Selected varieties. Minute Maid, Nestea Iced Tea Or Allen's Tetras $1.99 Sale Price Selected sizes. Selected varieties. Stouffer's Or Lean Cuisine Entrees $1.99 Sale Price $1.80 S.
avings Selected sizes. Selected varieties. Pampers Or Huggies Diapers $32.75 Sale Price 92-198 un. Selected varieties. Jamieson Vitamins And Supplements 50% Savings Selected sizes. Selected varieties. Large Red Prince Apples $1.29 lb Sale Price Metro Wekly flyer Product of Ontario. Canada extra fancy grade. $2.84 kg. Foodland Ontario. First of the season. Front Street Bakery Large Muffins $3.99 Sale Price $1.00 Savings Pkg of 6, 510-600 g. Selected varieties. Strawberries, Blueberries, Blackberries, Seedless Mini Watermelons 2 $5.00 Sale Price Strawberries 454 g, product of USA, no. 1 grade. Blueberries 170 g, product of Peru or Argentina, no. 1 grade. Blackberries 170 g, product of Mexico. 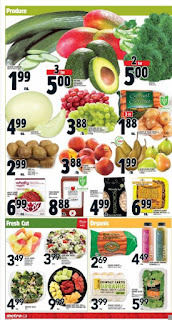 Seedless mini watermelons product of Guatemala.Front Street Bakery All Butter Croissants $3.99 Sale Price $2.00 Savings Pkg of 2, 600 g. Front Street Bakery All Butter Croissants $3.99 Sale Price $2.00 Savings Pkg of 2, 600 g. Mixed Berry Yogurt Parfaits 2 $5.00 Sale Price 328 g.